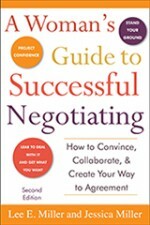 Why leave money on the negotiating table when it can be yours? Category: Books by Lee E. Miller. 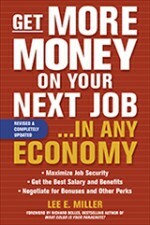 Lee E. Miller,the author of the critically acclaimed Woman’s Guide to Successful Negotiating (McGraw Hill) and Get More Money on Your Next Job (McGraw Hill), along with Barbara Jackson, the former Director of the Office of Management and Budget for the State of Massachusetts, shows readers how to get others to want to help them. 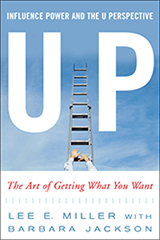 The most successful people, the ones that organizations turn to time and time again, exert a special type of influence—the U Perspective. Their secret is to uncover and address what others want, which enables them to build lasting agreements that always achieve their goals. Getting what you want, in every aspect of your life, requires knowing how to gain the cooperation and support of others. Lee E. Miller’s unique 3Cs- Convince, Collaborate and Create- Approach to Influencing will enable you motivate people to want to help you. Together with Barbara Jackson. Lee will teach you how to harness the power of the U Perspective. Whether you are seeking additional resources from your from your boss, better results from your employees, additional sales from your customers or lower prices from your suppliers, Lee and Barbara will show you how. Tom Shull, Chairman and CEO, Wise Foods, Inc.